World’s first ball screw based IoT-Enabled, industrial grade professional 3D printer with patented Advanced Fusion Plastic Modeling (AFPM) Technology. 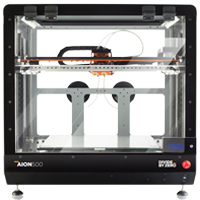 The revolutionary AION 500 MK3 is a high performance, IoT-enabled, massive size 3D printer that offers a professional-level build volume at an affordable price point. Armed with our patented AFPM (Advanced Fusion Plastic Modeling) technology, the printer renders a stronger and durable output. With multiple connectivity options and sensors, it is one of the most advanced 3D printers available across globe. 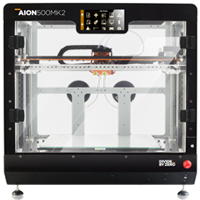 Offering a large build size, ultra-fast print speeds, minimal post processing, and unmatched precision, the AION 500 MK3 is designed for versatility. From prototyping to low-volume manufacturing, the AION 500 MK3 excels at any design application with impeccable accuracy and cost-eectiveness. AION 500 MK3 is designed to add maximum value to professional work setups. Completely configurable user-level control access lets you upload design on to the 3D printer right from your desk, over secure connection. Mullti-user interface on the machine lets you start printing right from your desktop browser window. With our years of experience in machine building, we have developed unique X-Y motion system in AION 500 MK3 that moves Z axis as print is being build on stable build platforms. 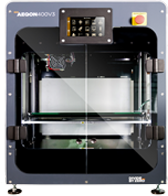 With this mechanism Aion 500 MK3 can print up to 50% faster without compromising on precision. Active carbon filter continuously cleans air inside the machine chamber, Providing safer work environment for users. Our patented 3D printing firmware–hardware combination ensures adaptive flow & temperature changes in material deposition ensuring better Component strength. Aion 500 MK3 is ready for industry 4.0. You can control Aion 500MK3 using web browser on your LAN or VPN. The operator keeps an eye on the production process via live imaging, while necessary presence is reduced. This machine is also ready with interface for robot handshake in case of implementation of complete automatic print setup. Aion 500 MK3 comes with patented precision filament flow sensor that tracks consumption of the material flow through extruder & compares that with the consumption indicated in the G code. In case of material flow interruption, the machine resolves the condition pro-actively by cleaning nozzle automatically. Servo + Ball screw combination gantry ensures precision 3D printing even at maximum speeds. 32 bit encoder system ensures 5 microns command resolution. ABS+, PLA, Metal fill, Carbon Fibre, Polycarbonate, Polyurethane, ABS PC, AFPM special.